“Amigurumi” is Japanese for “knitted stuffed toy.” It’s a style of toy that’s become popular with crafters even outside of Japan in recent years. 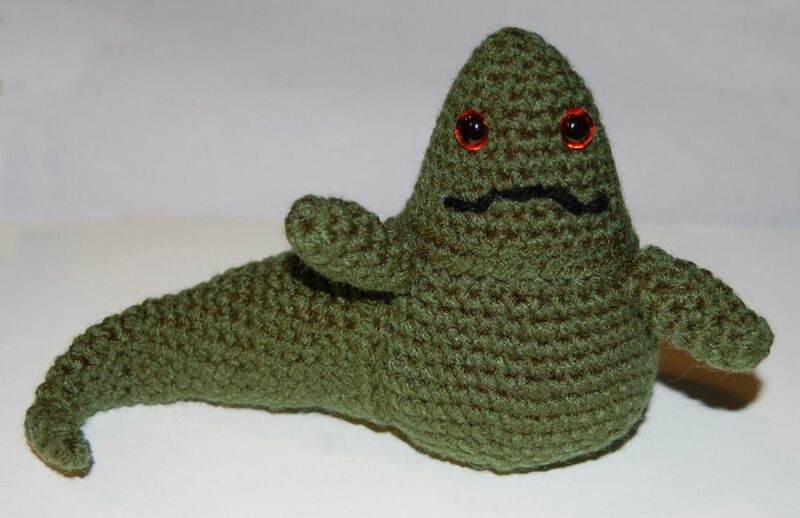 I got this Amigurumi Jabba from the eBay seller little_hippo, who apparently makes these to order. You can still buy one from her as of this writing, and she has several other Star Wars characters like Boba Fett, Yoda, Chewbacca, and even Lando. His body is roughly 6 or 7 inches long (depending on if you stretch out his tail) and he stands about 4.5 inches high. As I’ve said in the past, I really like cartoony or cute depictions of Jabba, so this was a must-have for me.